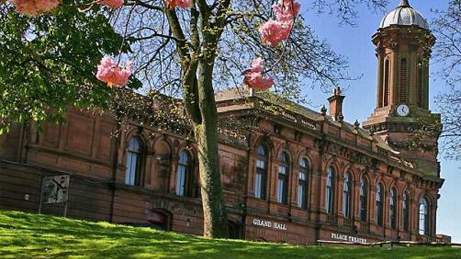 The Palace Theatre is a 500 seat theatre which offers a year round programme of music, comedy, drama, dance and light entertainment, offering something for all the family and sits adjacent to the Grand Hall in Kilmarnock. Many productions are supported by an educational programme of events and workshops and regular live music events take place in the Palace Theatre, Cafe Bar, Grand Hall and, from time to time, at some of our other venues. The Grand Hall which famously sold out Billy Connolly in under an hour has also seen Sean Lock and Scottish sensation, Kevin Bridges, pull in huge audiences. The Palace Theatre's Café Bar features regular monthly comedy slots which showcase up and coming comedians from the comedy circuit. Scottish Comedian of the Year competitors and winners make frequent appearances. The Theatre also annually hosts the Sneaky Edinburgh Fringe Preview featuring the hilarious Craig Hill. The Café Bar is the perfect place to relax with drinks before heading to the show. You can also pre-order your interval drinks to beat the queue.